We hope you find the answer to your question here, but if not please contact us and we will get back to you within 24 hours. Will I get back to my cruise ship before it departs? Absolutely! We have never missed a departure. All our shore excursion tours are carefully planned and timed to ensure that everyone gets back on board well before departure. Tour departures vary depending on the day, time and season. Please see our calendar for tour schedules. Prices for daily tours and cruise ship excursions are listed in the booking information. We are happy to refund the cost of tours up to 24 hours before departure. Private hire cancellations are handled on a case by case basis. The gift vouchers are valid for one year from the date of purchase. Can we book the train for private functions? Of course! We are delighted to take bookings for weddings and private functions. Please contact us to discuss availability and your requirements. Do we get snack and coffee breaks? On tours of less than two hours we do not stop for refreshments, however for tours over two hours we do stop for a meal break. Do you allow food or drinks on the train? Unfortunately eating and drinking is not permitted on the train. Is there a washroom on the train? The train is not fitted with washrooms, however most of our tour stops have such facilities available. Can children accompany parents or guardians on our tours? 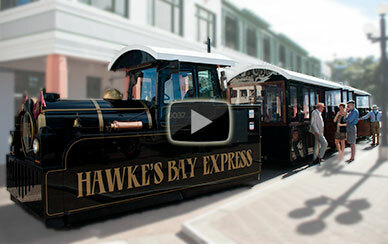 Children are welcome on the Hawke’s Bay Express, as long as they are with an adult guardian. Can I bring my luggage with me on the tour? To ensure the safety of other passengers and the security of your luggage, please leave these items in your vehicle or at your accommodation. But do remember to bring your camera! Bookings through our website or the i-site accept credit cards. For private hire booked with us directly, bank transfers/cash or cheques are accepted. For last minute bookings we are happy to accept cash. Yes – we work with a very secure banking system and we never share your details. It’s not essential, but during busy periods we do reach capacity, hence we recommend booking your ticket in advance. Yes, there are several photo stops – so bring your camera! Do you go on tour if the weather is cool or wet that day? Yes – we have a comfortable and dry train, no matter the weather outside! Do you offer refunds if our trip gets cancelled? Yes – in the unlikely event of your tour being cancelled a full refund will be issued. Please contact us directly for group booking. No, our ticket price includes the 15% GST and admission to attractions. Meals and refreshments are not included in the ticket price. Seating is assigned on a first come first served basis. All you need to do is select a tour and follow the instructions to book. Please print out your ticket and bring it along with you for admission on the tour. I sent you an email just now - when can I expect a reply? We aim to respond to your email within 24 hours. Please help us to respond quickly by enclosing any previous email correspondence. We respond to all our emails, so if you have not heard from us within 24 hours or if for some reason you are in doubt, please give us a call. Do your tours operate in the winter? Our daily Art Deco tours operate from late December till April. Special or private tours operate all year round. Do you do hotel pick-ups and drop-offs? For individuals or small groups we do not do hotel pick-ups at this time. For people attending a conference in Napier or groups of more than 20 people and private bookings, please contact us and we can discuss your requirements. There is a special published rate for school children and under 5’s for daily tours and cruise ship excursions. Private hire, one-off tour requests and special occasions are all priced on application.